It seems to be the topic we hear about most often, that brazen woman who was BREASTFEEDING HER BABY in the mall, at the beach, at the pool, on an airplane, or in a restaurant. Sometimes people make a big fuss and this makes headlines. And once a soon to be mom reads these awful stories she becomes afraid of what is to come. She feels the need to apologize for her baby’s need to eat. She becomes fearful of going out in public in case her baby *gasp* gets hungry. This is not how we as a society should feel. Babies should not be an inconvenience, they do need to eat, just like toddlers, children, and adults. The reality is that the vast majority of babies are fed in public without someone trying to stop that from happening. Most moms go on about their business feeding their tiny humans without a second thought or awkward glance. However it sometimes takes practice to get to a point that moms are comfortable feeding their babies in public. There are many types of commercially available nursing covers for those who want to be covered. 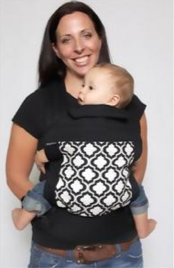 There’s the drape style covers that go around mom’s neck and cover the entire baby, which are probably what you think of when you hear nursing cover. Truth is there are many more options. Some moms find that layering things like nursing tanks under a regular shirt allows them to feel covered. There are even neat things like the Moboleez Nursing Hats, which allow some privacy from others, but don’t get between you and baby. The real truth is that you don’t need anything to breastfeed your baby, well, besides a breast, and a baby. Feeding your baby in public isn’t something to fear or have concerns about. If you are worried, self concious, or even fearful about feeding your baby in a public place there are things you can do. Practice In Front of a Mirror. Yes, that’s right. Sit in front of a mirror and feed your baby. You can see what others see while you are feeding your baby. This should help give you some confidence, and you can make some adjustments if you feel like they are necessary. Be Confidant. Being confident, knowing that you are simply providing your baby with the food and nourishment they need can help you feel comfortable. Feeding your baby is an admirable thing. Wear Comfortable Clothes. The clothing you wear can have an effect on how you feel and feed your baby. Some mothers prefer wearing layers so that they can be flexible and feel covered while feeding their babies. Often the first thing that draws someone’s eye to you is the color of flesh. The largest area of flesh typically exposed when breastfeeding is the stomach. Wearing a button down shirt over a nursing tank, so the stomach is covered can make it less obvious. Use tools that help you feel comfortable. The bottom line is that you need to feel comfortable, whatever that looks like. For some women that is just feeding their baby where ever they are, and for others, they want to use a cover of some sort. Whatever comfortable breastfeeding looks like for you is right for you. Don’t feel the need to apologize for it. Practice in Safe Places. Go to new mom’s groups, either through your local hospital, local IBCLCs, La Leche League, or Breastfeeding USA chapters. Being around other moms in a safe place to breastfeed without fear of judgement can be a great way to gain confidence in your new skills. You can see other moms feeding their babies while you feed your baby and feel like this is normal. Being surrounded by a tribe is a powerful thing. Be gentle with yourself as you navigate what can sometimes be an uncomfortable first experience. Have confidence that you are doing what is best for your baby, and don’t apologize for putting your baby first. Go and breastfeed moms, you’re doing a great thing for your babies! 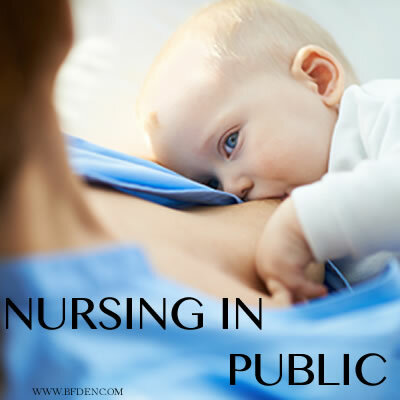 Do you have any tips that helped you feel more confidant nursing in public?